Se propone una aproximación conceptual de un modelo de gestión de energía en el hogar, denominado GEDE (Gestión de Energía Eléctrica Domiciliaria), el cual tiene como fin principal contribuir con la eficiencia energética domiciliaria; el modelo involucra protocolos de comunicación, infraestructura y software como herramienta de gestión para la toma de decisiones energéticas, relacionadas con el consumo y/o generación de energía eléctrica por parte del usuario final residencial. A conceptual approach of a home energy management model called GEDE (acronym in Spanish), which mainly aims at contributing to the domiciliary energy efficiency is proposed; The model involves communication protocols, infrastructure and software as a management tool for making energy decisions related to consumption and / or generation of electricity from the residential end user. Keywords: domotic, monitoring, protocols, home management, software. H. Chen, T. Ngoc Cong, W. Yang, C. Tan, Y. Li and Y. Ding, “Progress in electrical energy storage system: A critical review”. Progress in Natural Science, pp. 291-312, 2009. H. Jinsoo, C. Chang Sig and L. Llwoo Lee, “More efficient home energy management system based on ZigBee communication and infrared remote controls”. Consumer Electronics IEEE Transactions on, vol. 57, pp. 85-89, 2011. S. Amin and B. Wollenberg, “Toward a smard grid: power delivery for the 21st century”. Power and energy Magazine, IEEE, vol. 3, pp. 34-41, 2005. A. Vega, F. Santamaría y E. Rivas, “Propuesta para elaborar un Modelo de Gestión para redes eléctricas domiciliarias: Aproximación conceptual”. Sixth International Symposium on Energy & Technology Innovation Forum, Gurabo–Puerto Rico, 2014. D. Villa, C. Martin, F. Villanueva, F. Moya and J. López, “A dynamically reconfigurable architecture for smart grids”. Consumer Electronics IEEE Transactions on, vol. 57, pp. 411-419, 2011. A. Vega, F. Santamaría and E. Rivas, “Modeling for home electric energy management: a review”. 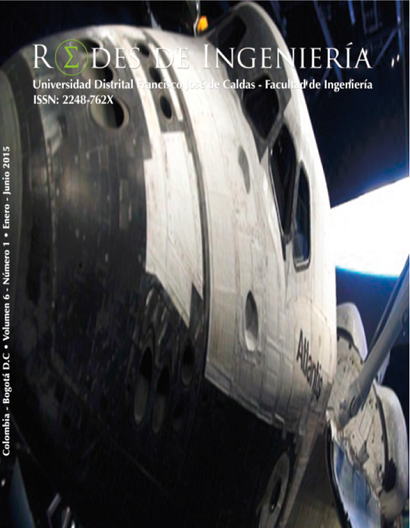 Renewable & Sustainable Energy Reviews, [en revisión], 2015. A. Snyder, E. Gunther and S. Griffin, “The smart grid homeowner: An IT guru?”. Future of Instrumentation International Workshop (FIIW), pp. 1-4, 2012. M. Coral and F. De la Rosa, “Simulation Platform for Domotic Systems”. Communications and Computing (COLCOM), 2014 IEEE Colombian Conference, Bogotá, D.C., 2014. B. JinSung, J. Boungiu, N. Junyoung, K. Youngil and P. Sehyun, “An intelligent self-adjusting sensor for smart home services based on ZigBee communications”. Consumer Electronics, IEEE Transactions on, vol. 58, pp. 794-802, 2012. L. Ching-Hu, W. Chao-Lin and F. Li-Chen, “Reciprocal and Extensible Architecture for Multiple-Target Tracking in a Smart Home”. Systems, Man, and Cybernetics, Part C: Applications and Reviews, IEEE Transactions on., vol. 41, pp. 120-129, 2011. Y.-X. Lai, C.-F. Lai, Y.-M. Huang and H.-C. Chao, “Multi-appliance recognition system with hybrid SVM/GMM classifier in ubiquitous smart home”. Information Sciences, vol. 230, no. 230, pp. 39-55, 22 of octubre, 2012. M. C. Bozchalui, S. A. Hashmi, H. hassen, C. Canizares and K. Bhattacharya, “Optimal Operation of Residential Energy Hubs in Smart Grids”. Smart Grid, IEEE Transactions on, vol. 3, 2012. B. Powers and B. Margossian, “Using a rule-based algorithm to disaggregate end-use load profiles from premise-level data”. In Transactions of the IEEE Computer Applications in Power, 1991. G. Hart, “Nonintrusive appliance load monitoring”. Proceedings of the IEEE, vol. 80, no. 12, pp. 1870-1891, 1992. L. Farinaccio and R. Zmeureanu, “Using a pattern recognition approach to disaggregate the total electricity consumption in a house into the major end-uses. In Energy and Buildings”. Energy and Buildings, vol. 30, no. 3, pp. 245-259, 1999. L. Marceau and R. Zmeureanu, “Nonintrusive load disaggregation computer program to estimate the energy consumption of major end uses in residential buildings”. Energy Conversion and Management, vol. 41, pp. 1389-1403, 2000. Z. Younghun, K. Schmid and M. Srivastava, “Viridiscope: design and implementation of a fine grained power monitoring system for homes”. UbiComp, pp. 245-254, 2009. The Cambridge, The Cambridge Dictionary of Statistics, 2012. H. Morsali, S. M. Shekarabi, K. Ardekani, H. Khayami, A. Fereidunian, M. Ghassemian and H. Lesani, “Smart plugs for building energy management systems”. Smart Grids (ICSG), 2nd Iranian, Iranian, 2012. B. Capehart, E. Muth and M. Storin, “Minimizing residential electrical energy costs using microcomputer energy management systems”. Computers & Industrial Engineering, vol. 6, no. 4, pp. 261-269, 1982. H. Pigot, B. Lefebvre, J. Meunier, B. Kerherve, A. Mayers y S. Giroux, “The role of intelligent habitats in upholding elders in residence”. 5th international conference on Simulations in Biomedicine, Slovenia., Slovenia, 2003. J. Byun, I. Hong and S. Park, “Intelligent cloud home energy management system using household appliance priority based scheduling based on prediction of renewable energy capability”. Consumer Electronics, IEEE Transactions on, vol. 58, pp. 1194-1201, 2012. T. Kawakami, T. Yoshihisa, N. Fujita and M. Tsukamoto, “A Rule-Based Home Energy Management System Using the Rete Algorithm”. 2013 IEEE 2nd Global Conference on Consumer Electronics (GCCE), Japón, 2013. D. Shahgoshtasbi and M. Jamshidi, “A New Intelligent Neuro–Fuzzy Paradigm for Energy-Efficient Homes”. IEEE Systems Journal, 2014. S. Li, D. Zhang, A. Roget and Z. O’Neill, “Integrating Home Energy Simulation and Dynamic Electricity Price for Demand Response Study”. IEEE Transactions On Smart Grid, vol. 5, no. 2, pp. 779-788, 2014. M. Zaeri, N. Sharda and A. Zahedi, “A Five Layer Model for Simulating a Virtual Power Plant”. IEEE Innovative Smart Grid Technologies, Kuala Lumpur, 2014. A. Sachdeva and P. Wallis, Our demand: reducing electricity use in victoria throughdemans management, Melbourne, Monash Sustainability Institute, 2010. B. Dahlbom, H. Greer, C. Egmond and R. Jonkers, Changing Energy Behaviour. Madrid, Intelligent energy europe, 2009. L. Hernandez, C. Baladron, J. Aguiar, B. Carro, A. Sanchez, J. Lloret and J. Massana, “A Survey on Electric Power Demand Forecasting: Future Trends in Smart Grids, Microgrids and Smart Buildings”. Communications Surveys & Tutorials, IEEE, vol. 16, no. 3, pp. 1460-1495, 2014. Y. Kim, Y.-H. Kim, H.-M. Oh and S. Choi, “BER Performance of Binary Transmitted Signal for Power Line Communication under Nakagami-like Background Noise”. The First International Conference on Smart Grids, Green Communications and IT Energy-aware Technologies, Venice, 2011.